When will be Homicide City next episode air date? Is Homicide City renewed or cancelled? Where to countdown Homicide City air dates? Is Homicide City worth watching? Homicide City dedicates its first season to crimes that shook Philadelphia to its core. The series explores cases from a darker time that had police detectives banding together across the metropolitan landscape in a sequence of manhunts. From the mansions and manicured lawns of the wealthy Mainline suburbs to the inner-city Badlands, each episode is told through the eyes of veteran homicide detectives, local beat reporters and the victims' families who lost so much.In each episode of Homicide City, Philadelphia's finest come out of retirement to tell the inside story about a headline-making case they'll "never forget." Fortune and love do little to protect the fate of Philadelphia's victims as stories include the attack on Lockheed Corporation's wealthy CEO, Courtlandt S. Gross; the death of John Thurberg months before his wedding; and the killing of an expectant mother, Natise Johnson. Nonetheless, viewers will find a sense of justice in the commentary provided by former Montgomery County Chief Oscar Vance; retired Philadelphia Police Sergeant William Britt; Philadelphia Inquirer investigative journalist Larry Lewis; and other local experts. When 18-month-old Devon Manderach's body is found in a park outside Philadelphia, police suspect her parents; when her father calls looking for both the toddler and her mother, police learn the case is more horrific and tragic than they imagined. When Bill and Catherine Stuart are executed in their home along with their 3-year-old daughter, police look to surviving daughter Miriam for clues; her description of the killer leads detectives deep into Philadelphia's criminal underworld. When Ellen Robb's husband finds her murdered in their quiet suburban Philadelphia home, evidence points to a robbery gone wrong; however, police dig deeper into the couple's life, and they learn the motive may be far more sinister. When Helen Bernstein is found dead in the bathtub of her Chestnut Hill high-rise, she appears to have died of natural causes; when an autopsy reveals she was strangled, detectives ask who would want Helen dead and why. When 78-year-old George Volz's family finds him hogtied and decomposing in his Philadelphia row house, police turn the elderly man's neighbors for help. Homicide City next episode air date provides TVMaze for you. 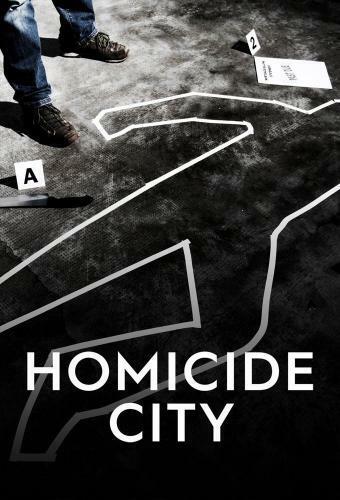 EpisoDate.com is your TV show guide to Countdown Homicide City Episode Air Dates and to stay in touch with Homicide City next episode Air Date and your others favorite TV Shows. Add the shows you like to a "Watchlist" and let the site take it from there.